A snapshot is often referred to as an image capturing a moment in time. As I sat in my home office in the waning days of 2017, a light snow was falling outside and I had a hot cup of coffee in hand. When the closing New York Stock Exchange numbers scrolled across the television, one particular company caught my eye. The three letters signified more than a company to me. WGO or Winnebago Industries was a way of life growing up. Everything I knew was connected to those three powerful letters. Winnebago Industries fed our family, put clothes on my back and helped me through college. Winnebago was founded by John K. Hansen in 1958. The company built recreational vehicles that allowed members of what is now considered the Greatest Generation the freedom to explore the country without leaving comfort behind. My dad started working for Winnebago Industries in 1968. He retired in 2004. During that time he held prominent positions in design, concept development, and marketing. He was highly respected and built a comfortable retirement after years of work. After his untimely death in 2009, I heard less and less about the status of the company. My mother kept me up to date through her lens as a city council member. In 2014 she moved to Central Iowa, and the news I heard from the company was little to none. Lately, the news I hear from friends that live in Forest City and work for Winnebago Industries concerns a corporate restructuring that has moved members of the executive team and central office employees to Minneapolis, Minnesota. A move that by some accounts could signal tough times for my hometown of Forest City. That is why I decided to chronicle the impact that decisions by the executive team of Winnebago Industries will have on Forest City. Many believe there is a divide forming between the success of the company and the vitality of the city. For those that have lived in Forest City, this theory will not come as a surprise. It would seem the fortunes of the town, or lack thereof, have always been tied to the success of Winnebago. However, for myself and others in the community, this point in time feels different. As a point of reference I will use December of 2017 as a snapshot to paint a picture of Winnebago Industries and the town of Forest City going forward. I am calling the ongoing series "Deconstructing Forest City." In the upcoming months, years and maybe even decades I want to shed light on the struggles and successes of Forest City. I hope to do that, by using journalism as a tool, that provides first-hand accounts of what is happening in the North Iowa town of 4,013 people according to the 2016 census. If you would like to help with this ongoing story or if you have feedback you can leave a message below or email me at jmurphpix@icloud.com. 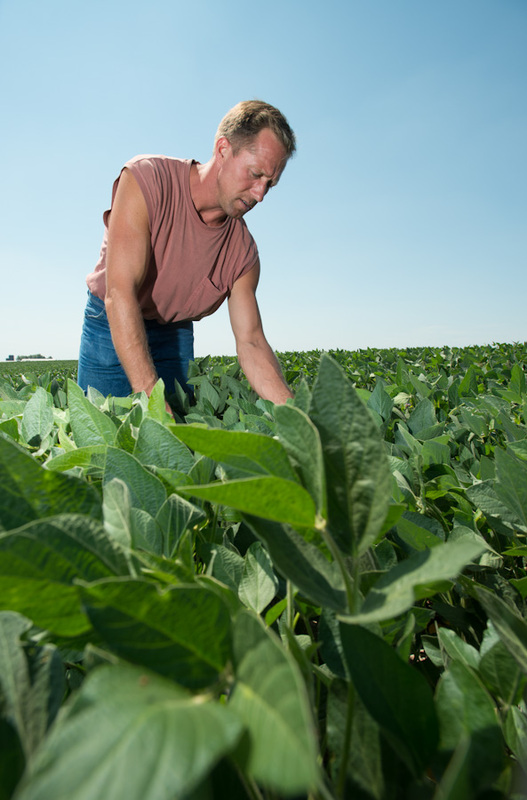 With an optimistic eye on the weather, Jerome Burken, an Iowa Soybean Association member, still has hope that his crops will beat the drought that is impacting much of the Midwest. For Jerome and his son, Gary, timely rains and rich soil on their Clinton County farm have given them hope. Now all they need is rain. As Jerome Burken pauses from working at his workbench, he peers out of his machine shed at one field of corn, which looks good. One mile down the road Gary Burken prepares to bale a hayfield that is doing great despite the lack of moisture. “If we don’t get rain for the next two or three weeks it could be a whole other situation,” Gary Burken said while placing his wrench on the table. His son Gary agrees with the assessment of their fields and attributes the decent crop conditions to heavy rains that they received in April. 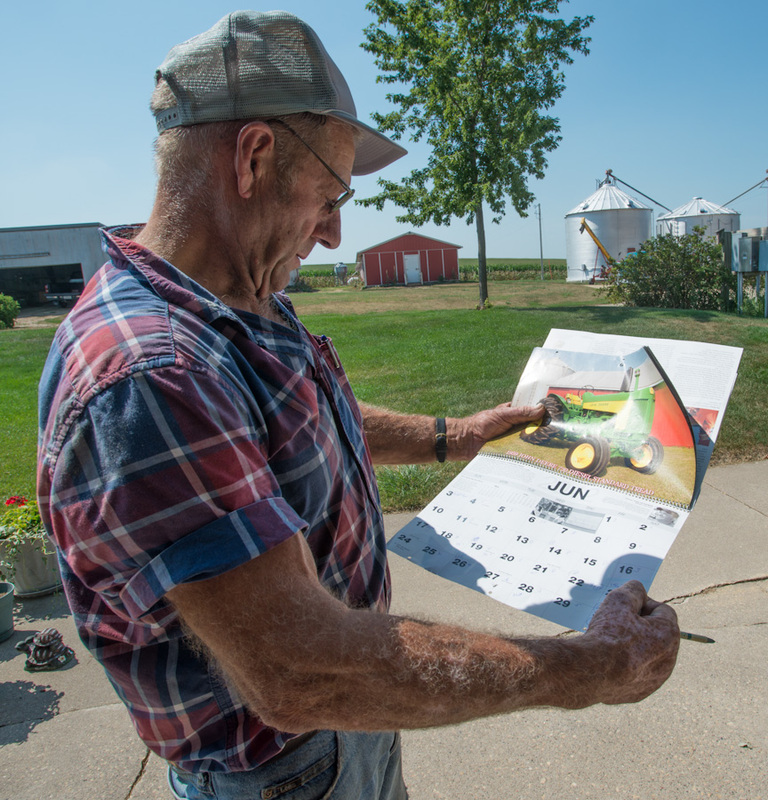 A calendar that Jerome Burken uses to track rainfall on their farm west of Clinton shows five rains that only produced about three inches of rain. “We had a lot of subsoil moisture and I think that is what we are thriving off of now, but it has to be running out,” Gary said while looking over the rolling hills of his Clinton County hayfield that will be used to feed his cattle. Gary is happy with the performance of his hay fields even being in the fourth and fifth year, but he is keeping a careful eye on the markets related to the cost of corn and other feed. He said soon he will have to make tough decisions that will impact his livestock business next year. Other areas not far from the Burken farms haven’t been as lucky. Farms near McCausland just 17 miles to the south have fields of corn that are brown and down from wind damage. According to the USDA Crops and Weather report released on Monday corn and soybean conditions declined slightly last week. The forecast for measurable precipitation still looks bleak for much of the state according to the Weather report. Temperatures for the week as a whole averaged 4.2 degrees above normal making this the thirteenth week of the past fourteen to average warmer than normal. It also showed that the statewide average precipitation was 0.62 inches or about twothirds of the weekly normal of 0.96 inches. This was the twelfth week of the past thirteen with less than normal rainfall.